Part of our TSH Resort collection – these shorts come from the same cut as our Team Shorts. Charcoal grey with pink rubberized logos. They feature an inseam of 7.5 inches or 19.05 centimeters on all sizes. We love them with the grey sprinkles jersey and our resort flowers jerseys. One difference on the construction of these shorts is we added a 45mm gripper that grabs the leg gently, leaving little or no impression on the legs after a long day in the saddle. They just feel lighter because of this new gripper. They come with our standard high performance chamois recently tested over 8 days at the Absa Cape Epic! We call these our “shorter inseam team shorts” because they have an 7.5 inches or 19.05 centimeters inseam on all sizes. These have proven to be some of our most popular shorts. They are not short shorts but lets call them “medium’ length shorts. Perfect for any height but especially for anyone who is tired of shorts going righ to her knees. We use our custom TSH monogrammed leg gripper on these shorts. They will stay where you put them because on the inside we placed some silicon dots for extra security. Tan lines will not be compromised! The fabric is high compression, made in Italy and extremely durable. 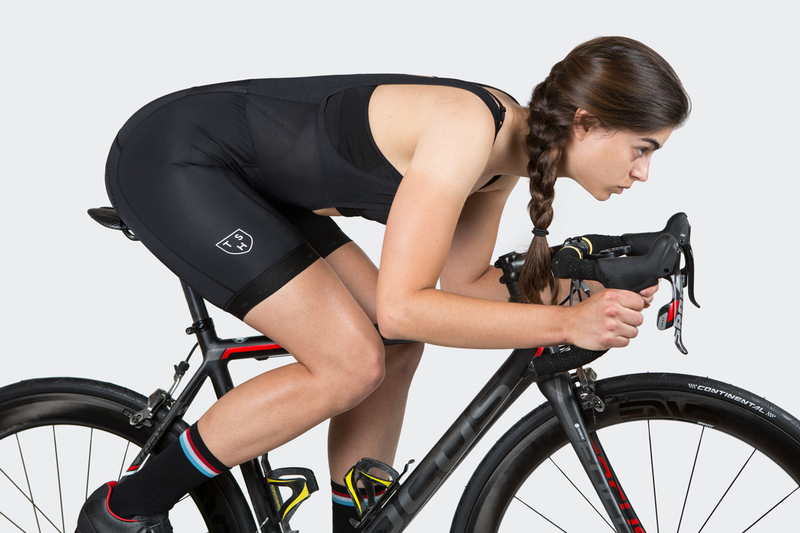 Our standard high performance chamois complements these shorts technical attributes. These are our first Team Shorts. The logo has Tenspeed Hero spelled out on the side panels. What separates them from our shorter inseam shorts? It is the inseam! For the record they go like this: (X-Small 7.5 inches / 19.05) (Small – 8 inches / 20.32cm) (Medium 8.5 inches /21.59cm) (Large 9 inches / 22.86cm)(X-Large 9.5 inches / 24.13cm). We consider these standard lengths so they are not too long. For instance the medium size is just one inch longer than our Shorter Inseam Team Shorts. Buy them if you like a longer short, more protection from the sun, or you are taller than 5 foot 8 inches (1.72 meters). It has the same high performance, long mileage chamois and our custom TSH monogrammed gripper as the Shorter Inseam Team Shorts. We made these shorts for when you may want to forgo bib straps. Easy on and easy off. They fit very similarly to our club shorts. Very comfy and yet maybe the most technical shorts we make. Besides the strapless function they also feature an ergonomic cut similar to our Pro Women’s Shorts and a 77mm leg gripper that leaves no mark. It is easiest to just lay out the features on these shorts because they are unique to our line. Three different fabrics make up the body of this ergonomic cut. Each with a different stretch and feel. All made in Italy. The bib straps have a full lycra back panel so the straps stay in place better than any short in our line. A 45mm leg gripper leaves no impression on the legs. They come with our standard high performance chamois for added comfort. Every seam is flat-lock stitched so there is no additional fabric on the skin. Reports from our sponsored riders say they have less compression than our Team Shorts. The inseam is a continuous 7.5 inches throughout. Thermal Shorts? Yes! Do you ever wish your bum was not so cold on early morning Spring or Autumn rides? If so, these are the shorts for you. If you own several bib shorts then should be considered an essential next option in your collection. The cut is similar to our Team Shorts and the leg gripper utilizes our custom TSH monogrammed gripper. They will not move and secures leg warmers with the best shorts available. Our standard chamois makes long autumn rides extra comfy. These shorts are already loved, so much that we had to order more after one month on our site. Navy blue so like your daily wardrobe pairings you can match these with any number of tops. Yellow rubberized logos give them a bit of a bright spot. They feature our Team Short cut with an inseam of 7.5 inches on all sizes and come with our 45mm leg gripper that leaves no marks on the legs. We would argue these shorts also have the best women’s chamois on the market. These are our shortest bib shorts we make. Essentially they are “Team Short” in cut but with blacked out logos. We had so many requests from women around 5 foot tall (1.52m) to make a 6.5 inch (16.5cm) inseam. Because of their length we added our TSH leg gripper so they will not move from their placed location. Black bib straps keep their stealth look. Perfect for any short or jersey with their minimal look. Of course they have our best chamois! Tags: Bib Shorts, Tenspeed Hero.